The Science program aims to produce scientifically literate individuals, fluent in the scientific method and its application, to investigate and create a personal understanding of the natural world. It seeks to provide the student with a body of scientific knowledge as well as promote active inquiry and investigation of scientific principles through interactive instruction and real-world applications. Courses will emphasize the link between understanding scientific facts, concepts, processes and natural phenomena, and its integration with quantitative skills and analytical thinking. Students will be encouraged to think scientifically, to solve real-world problems through reasoning and logic, and finally to evaluate the processes and outcomes. In Grade 9, students take a semester in Earth Science and another in Chemistry. In Grade 10, students take up Biology in one semester, and Physics in another. Biology includes the exploration and investigation of such topics as cells, evolution, ecology, conservation, genetics, human health and physiology. 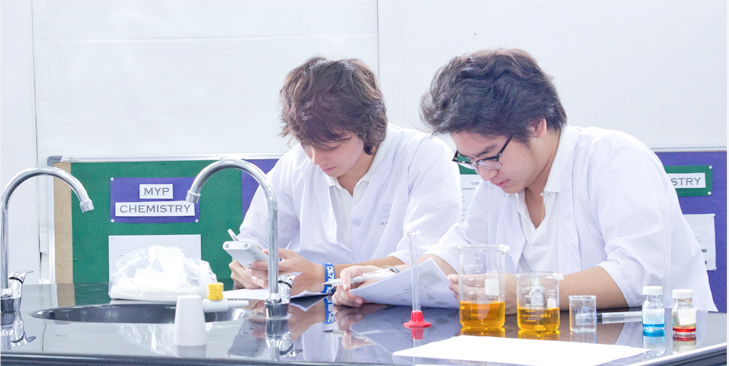 Throughout the course, students will demonstrate an understanding of scientific terminology, facts and concepts; scientific methods and techniques; and methods of presenting information. They will also apply their understanding in order to communicate effectively and present scientific information, as well as construct, analyze, and evaluate hypotheses, research questions and predictions, scientific methods and techniques, and scientific explanations. Students will also demonstrate the personal skills of cooperation, perseverance, and responsibility appropriate for effective scientific investigation and problem solving. They will also demonstrate manipulative skills necessary to carry our scientific investigations with precision and safety. Chemistry as a core science is primarily interested in furthering the students’ understanding of how science is condicted and how the world works. With this in mind, the course provides opportunities for students to look at the fundamental councepts of atomic structure, periodicity, bonding, energetics, kinetics, equilibrium, acids and bases, oxidation and reduction, and organic chemistry. Through the development of content knowledge, and iinvestigative skills, students will engage in real-world simulations and address problems seen through various contexts. Through formative discussions and presentations, communication skills will be honed, collaborative thinking encouraged, and the frequent use of inquiry will help to address some of the more challenging problems. Physics is the application of mathematics to the physical world. Observing and keeping track of what happens is made much simpler when a thorough understanding of how math and physics are intrinsically linked; this course is designed to do just that. By looking at mechanics, thermal physics, harmonic motion, electric currents, fields, nuclear physics, and energy, students will be given the opportunity to relate how the world can be explained and why it works as we observe it. Also, as physics is a fundamental science, it will be built upon the backdrop of experimentation within the classroom, so students can explore the different phenomena we encounter firsthand. The design component of the class will be emphasized greatly, looking at how the theoretical science we discuss can translate into an achievable and data-producing experiment. As this is the backbone of physics, it is necessary that students understand the interplay between theory and results. With this, the economic and ethical implications of different experimentation will need to be discussed and should be welcome within the classroom. The instruction of physics will incorporate both global and local perspectives on issues surrounding types of research and as stated above the ethical, economic, and even environmental implications of various types of research being conducted in the world today. Environmental Systems and Societies is a transdisciplinary course, considered both a course in Individuals and Societies, as well as an Experimental Science. Students enrolled in this course seek to understand the connections between environmental systems and societies that inhabit these systems. This course employs a systems approach in the study of the environment and how society deals with it. A holistic learning approach is emphasized through the course by identifying components of the systems, and examining the relationships and processes that link these elements into a functioning entity. Students use local and global materials, as well as technology, to learn the concept of sustainability and the concepts behind conservation and environmental management.